Here’s an obvious hint about where the most risk awaits: use of hybrids for originating loans, as opposed to valuing REOs or collateral for existing loans. Appraisers / AMCs / inspectors providing hybrids for loan origination are the canaries in the coal mine. Of course, I’ll be addressing a number other issues too. The joint TAFAC and IAC meeting takes place on June 7 in Arlington, VA. Here is a link to the event. EO companies should take the initiative and specifically describe which hybrids they will cover, which they will not, company by company, and include the question if appraisers complete these types of non fnma form and non gp form reports in the yearly qualification application. Are they insuring my errors and omissions or someone elses, or both? Just the thought of practicing without the protection of EO insurance keeps most appraisers away. Questions that need answered. I started researching these last year when I noticed them surface . The only thing I could find is that other appraisers didn’t like it. For good reason, these are priced $100 +/-. Accepted by Fannie and look at the big lenders using them. Cost, time and just about as much information as a 1004/2055. It’s coming and I haven’t read anything that disputes that other than a forum like this. Any of these so called inspectors need to furnish the appraiser with a copy of their license, E&O and qualifications so I can include them in the report. And they need to agree to indemnify the appraiser that relies on their reports. That’ll be the day. The scope of work is always the appraisers sole responsibility. We coordinate with the lender but ultimately it is our signature and therefore our rules of engagement. A foreign concept in mortgage lending, fnma rules spelled out before us, but still a necessary point to make. You know what turned me off from even trying hybrids, was the deceptive nature of the amc solicitation. Claiming lots of work in my area, lying about how well received their new hybrid programs are, having an apparent misunderstanding of time estimates vs actual time that would be spent, and as usual, not having a clue what the price value of the product should be. If the work was appealing beyond the normal standard, they would not have to call around and solicit for vendors. If 80% of origination work goes through amc’s, yet anywhere from 3/4 to half of all appraisers refuse to work for amc’s, they knew they needed a more efficient product to stay in the game. It would be better for the lenders to simply take the initiative and remove middle appraisal management companies from the circle of trust. IA complaint with the State of Indiana is presently being investigated by that states Attorney General’s office for the above cited report. They’ve called back on it twice now. There is so much more liability than what you have cited! Out of state appraiser lacking familiarity with other states laws; lacking reliable data, not performing highest and best use analysis (not everything about a property can simply be assumed); scope of work too limited to produce consistently credible results, and my favorite is the one where the appraiser has to sign the Certification and Statement of Limiting Conditions where the appraiser is stating that THEY have reason to believe the property inspector is competent and information is credible. I think the word used is they “deemed” him/it to be credible. 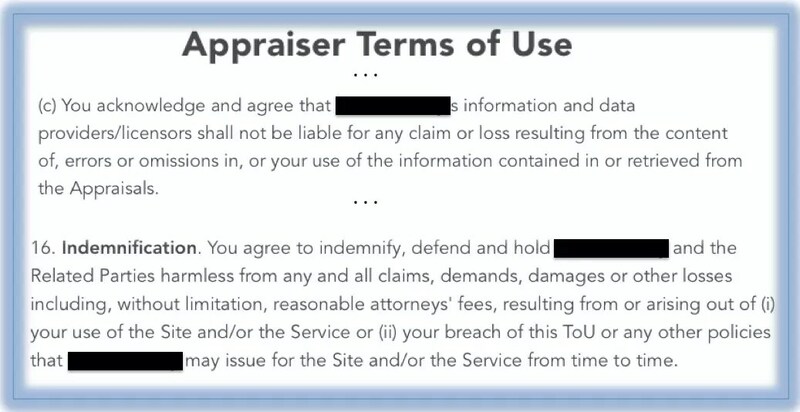 All such forms I’ve read also include small print verbiage that “Nothing contained herein limits or prevents the appraiser from adding such additional information as they may feel necessary.” A method for passing the buck right back to the appraiser for doing whatever EXTRA is needed to make the garbage-brid ‘appraisal-guesstimates’ 100% USPAP compliant…since they all claim to be. Don’t forget the appraiser or inspecting agent straight up copied photos and we were never sure which photo belonged to which house. And the appraisers participating are likely licensed in multiple states and all they likely do is the hybrid desk work. The guy who never leaves the desk and ceases to physically review properties will be deemed the most qualified in the hybrid world, it’s backwards thinking. I’ll take a hybrid, same fee as the 1004 form, and additional fees for the additional data I’ll have to sort through. The inspecting persons will have to sign and return an individual certification of absolutely truthful reporting for each and every inspection they perform in my absence, specifically noting the time date and person(s) inspecting. You know what really happens on the lender side of this all, where they’re ‘performing the inspection’? They use non licensed runners and you’d better believe it. They’ll hire a photo taker and that ‘inspection’ will cost 10 dollars and will almost certainly be performed by a non qualified person. It will be fun to read the engagement letters for the inspecting realtors; make sure your inspection person is not a felon, has shirt and shoes on, does not drink during inspections, etc, etc. The problem with outsourcing is you can no longer control the ethical social and quality standards which are taken for granted when working with only equivalently licensed persons. We don’t do them. That’s the choice each of us have to make and have to accept the consequences when they fail. Cutting corners always leads to failure. You get what you pay for….comes to mind.